Join Bob Fescoe of 610 Sports as he talks with Mitchell Schwartz, Kansas City Chiefs Lineman! 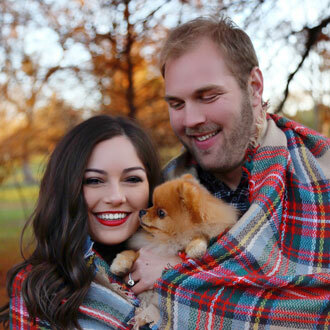 They will be discussing Schwartz's love of cooking, football, family - including brother Geoff and wife Brooke (pictured right), Jewish faith, as well as his beloved Pomeranian dog, Cupcake. Schwartz will also do a cooking demonstration, a family favorite — latkes, which everyone will get to taste! Schwartz will answer questions from the audience before signing copies of his book, “Eat My Schwartz” which he co-authored with his brother Geoff, a former NFL Player. Books will be for sale at the program. Be a sport and bring a dog food donation for the Jewish Family Services food pantry!